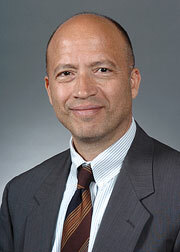 Hussein S. Khalil is director of Argonne's Nuclear Energy and Security Program. He oversees the Lab's research on nuclear reactor technology and nuclear non-proliferation. He joined Argonne in 1983 and has carried out research to optimize fast-reactor core design and improve computational methods for reactor physics, dynamics and fuel cycle analysis. Dr. Khalil is an Argonne Distinguished Fellow and a Fellow of the American Nuclear Society. He earned a Ph.D. from the Massachusetts Institute of Technology in 1983 and an MBA from the University of Chicago in 1996. Hussein Khalil, director of the NE Division at Argonne National Laboratory, is one of the scientists named Argonne Distinguished Fellows, the laboratory’s highest scientific and engineering rank. On March 17, 2011 Hussein Khalil, Director of Argonne’s Nuclear Engineering Division, participated in an experts round table about the ongoing events in Japan on the Chicago Tonight show on WTTW. On October 12, 2010 Hussein Khalil participated in a Reactor and Fuel Cycle Technologies Subcommittee Meeting in Washington D.C.
May 5, 2013: “Pandora’s Promise Film Screening and Discussion” — The University of Chicago hosted a film screening and discussion of the nuclear documentary Pandora’s Promise by Robert Stone on Sunday, May 5. Hussein Khalil was on the discussion panel following the film screening.